State and federal investigators believe at least two of the five suspects arrested in connection with a shoot-out Thursday that killed two sheriff’s deputies near New Orleans have ties to the sometimes violent, antigovernment “sovereign citizens” movement. “I had two officers ambushed – I even want to say assassinated,” St. John the Baptist Parish Sheriff Michael Tregre told reporters at a news conference, The Associated Press reported. According to news report, the incident began early Friday morning when a gunman fired shots that wounded an off-duty deputy providing security at a parking lot used by refinery workers in an industrial area west of New Orleans. Officers tracked a car seen speeding away from the site to a nearby trailer park. When they knocked on the door of a trailer, a person exited the trailer and opened fired with an assault rifle, killing two deputies and wounding another. Two of the suspects were wounded in the shoot-out. Louisiana State Police Col. Mike Edmonson told reporters at a press conference this afternoon that his investigators were still piecing together the sequence of events that led to the fatal shootings. There were “multiple scenes, multiple gunshots, multiple weapons” involved, Edmonson said. Edmonson said that although charges haven’t been filed yet, there’s more than enough evidence to bring felony counts against five of the suspects who were in a vehicle when the first deputy was fired upon. The deputies who were killed near Laplace, La., were identified as Brandon Nielsen, 34, and Jeremy Triche, 27. Two other officers, Jason Triche, 30, and Michael Boyington, 33, were wounded in an exchange of gunfire with the suspects and are hospitalized, according to various media reports. The two wounded deputies “are recovering and are in good spirits,” Tregre said. The sheriff said his department is receiving calls and e-mails from throughout the nation. The suspects arrested so far in the unfolding investigation are Kyle D. Joekel, Terry Lyn Smith, and Smith’s sons, Brian and Derrick Smith, who have lived in Tennessee and Louisiana, according to Lt. Robert Davidson of the DeSoto, La, Parish, who spoke with Hatewatch today. A fifth suspect, a woman, is also in custody but hasn’t been publicly identified. Davidson said that Smith identified himself as a sovereign citizen last November when he was served with a search warrant by officers in Robertson County, Tenn. That search turned up four rifles, ammunition and handguns, but it wasn’t immediately clear if arrests were made. Other law enforcement sources indicated that Joekel also may have ties to the sovereign citizen movement. Joekel is wanted on state charges in both Nebraska and Kansas, Hatewatch learned today. “We have an active warrant for his arrest,” Gage County Sheriff Millard “Gus” Gustafson told Hatewatch when he was reached in Beatrice, Neb. The sheriff said the warrant, issued Sept. 1, 2011, charges Joekel with conspiracy, resisting arrest, and possession with intent to deliver a controlled substance. The sheriff said he didn’t know what kind of drugs were involved. 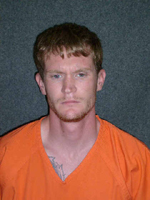 Joekel is wanted in Marshall County, Kan., for “multiple felony charges” contained in a warrant issued last year after a police chase involving the Marysville, Kan., police department and Marshall County sheriff’s deputies. Tim Ackerman, the undersheriff in Marshall County, told Hatewatch that the pursuit ended when Joekel crashed the pickup truck he was driving into a private residence and fled. Joekel fled on foot and eluded a massive manhunt involving state and local police agencies in Kansas and Nebraska, Ackerman said. Ackerman said that during the manhunt he called the U.S. Secret Service headquarters after he developed information that Joekel possibly had made a threat against President Obama. The Secret Service said it had no information on Joekel and directed the Kansas sheriff’s office to the Terrorism Screening Center in Washington, D.C. The undersheriff said he called the federal terrorism center on Aug. 22, 2011. Since that time, his office has obtained a felony arrest warrant for Joekel but has been unable to locate him. Davidson said is appears that Joekel was living in an RV park in Louisiana in May. “On May 22 of this year, we got a report of a break-in of a washeteria at the RV park,” Davidson told Hatewatch. Joekel and Derrick Smith were identified as suspects in that burglary, but formal charges haven’t been filed. The law enforcement official said he didn’t know if the suspects had ties to any white supremacist or militia groups but said Terry Lin Smith has posed for pictures surrounded by AK-47 assault rifles, ammunition and handguns. The Southern Poverty Law Center has produced a safety training video for law enforcement, detailing the deadly threats posed by sovereigns. More than 80,000 copies have been distributed to law enforcement agencies nationwide. In May 2010, two West Memphis, Ark., police officers were shot dead when they stopped a father-son team of sovereigns. Two other officers were seriously wounded in a subsequent shoot-out that ended with the deaths of both sovereigns, Jerry Kane and his 16-year-old son, Joe. Last February, another sovereign citizen, James Michael Tesi, 49, was sentenced to 35 years in prison for shooting police officer John Fossett in July 2011 in Hurst, Texas, near Fort Worth. Tesi, an occupational therapist, was charged with aggravated assault on a public servant with a deadly weapon. The charge stems from a series of encounters he had with police for not wearing a seat belt, speeding, failing to show up in court and not producing a valid driver’s licenses.